Of the five FAANG stocks, Amazon.com (AMZN) made positive headlines last week as its market cap briefly breached the trillion level intraday Tuesday before pulling back. Since the stock didn’t finish the day with a market cap above that level, it wasn’t official, but for a brief moment, the two AAs of FAANG were both members of the trillion dollar club. 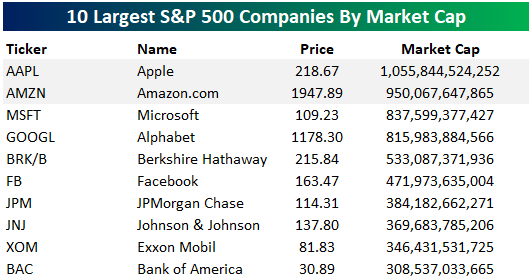 Looking at the ten largest S&P 500 companies by market cap, behind AAPL and AMZN, the only two stocks anywhere close to the trillion level are Microsoft (MSFT) and Alphabet (GOOGL), and when we say close, they still have to rally about 20% to get there. The next two largest companies — Berkshire and Facebook — would essentially have to double from here, while the remaining four stocks in the top ten would basically have to triple. Amazon’s road to a trillion has been extraordinary. It took AMZN 5,186 days as a public company to first cross the $100 billion mark, but only 41 days to go from $900 billion to $1 trillion (on an intraday basis). 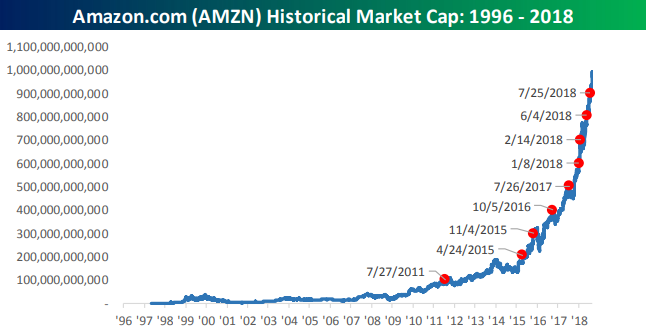 Since first crossing the $200 billion threshold in April 2015, AMZN has added $100 billion in market cap at an average of once every six months. Talk about a money machine!